The photo on the left is of the curtains that used to be in my sewing room. I purchased the fabric at Sanderson & Sons in London in 1991. I didn't make anything with it for 10 years!!!!!!! But it was perfect for my sewing room. But things change. I decided to use the lace curtains that had been in my grandmother's bedroom for my sewing room. I like the diffused light and the pattern. So what can you do with used curtains? Stay tuned! It has been a few weeks, but I am back to post now. I've had a crazy August and a hectic September, but tomorrow starts October and I am hopeful things will settle down. Hopeful I tell you! 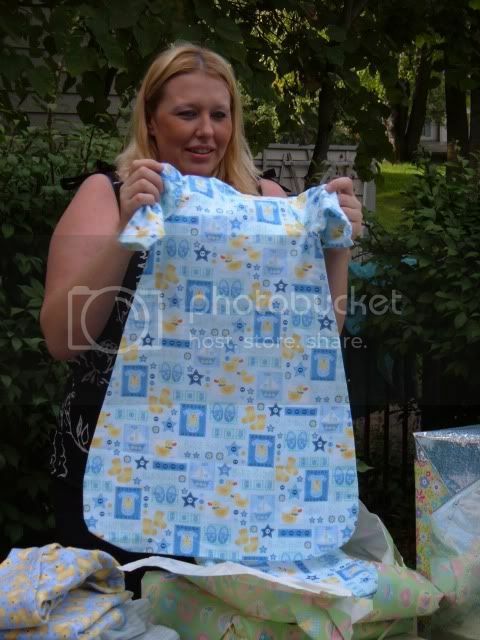 My first batch of sewing was to make baby things for my niece's little guy, who should be here by the end of October. I used an out-of-print Butterick pattern from 2000. The photo below is the clearest I have of the design, as I was in a hurry to wrap things up - and forgot to take photos! So these photos are from the shower itself. 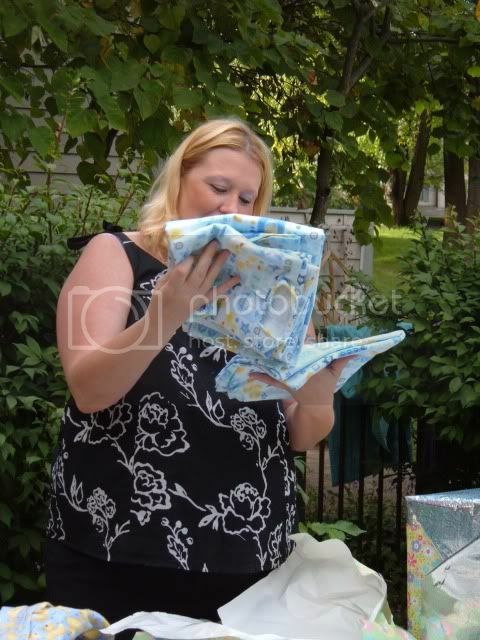 It was a beautiful day, and a great setting for the shower. Jennifer got a lot of things, but I was the only one to make what I gave, and my mother was the only other guest to offer a hand-made gift. She purchased a sweater, hat and bottee set that was hand-knit by one of her local senior citizens at a craft day. I used the out-of-print pattern to make a one-piece pajama with a matching hooded jacket (photo on left). You can't tell, but I used the left overs from one of the minky caftans I made over the winter ( http://sallysews.blogspot.com/2009/02/weekend-sewing-2-2-09.html ). I had to do some creative cutting, but it felt good to re-use what would otherwise be leftovers. The second set was a baby bunting from a McCall's pattern - I made it with a light blue/aqua/white print and a dark blue solid fleece (center and right photo). It was the "bag", a hat with bunny ears and a fringed fleece blanket. 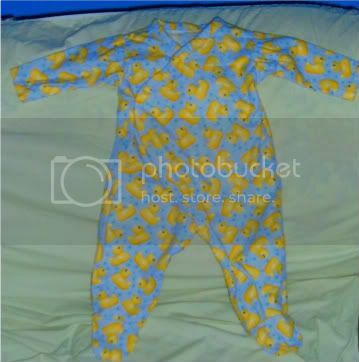 Then there was a set with the rubber ducky flannel (shown as first photo, above, and below) which was made up of a onesie pajama and a matching blanket. Not shown was a solid blue rib knit pajama. 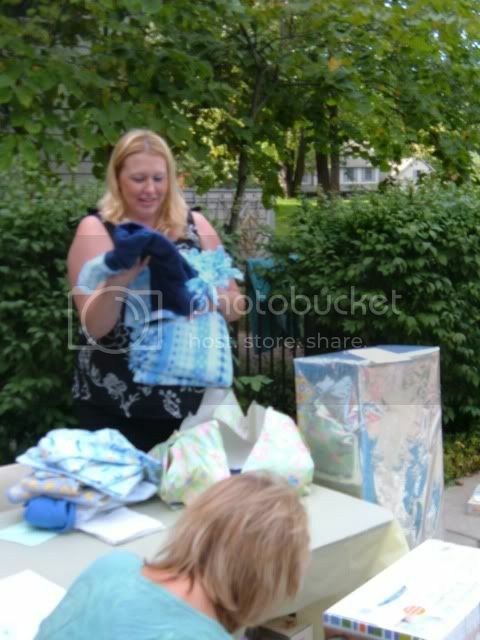 The fourth set was a flannel bunting with two matching larger blankets. And finally, since the baby is due on October 24 or 25, I wanted to be sure he had a Halloween costume. 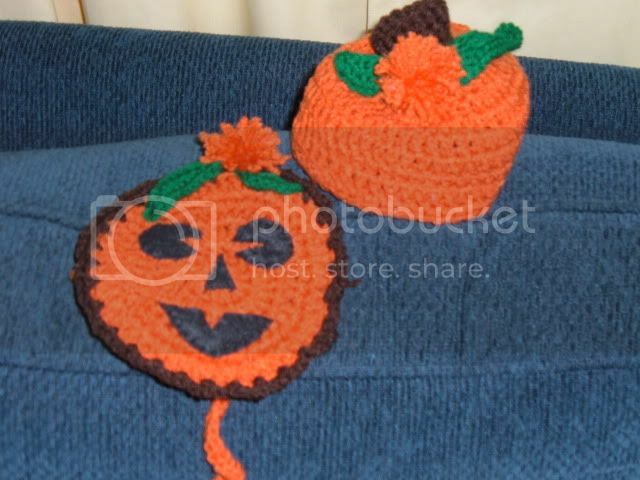 So I crocheted the pumpkin hat and bib below. The face on the pumpkin made from black craft felt. 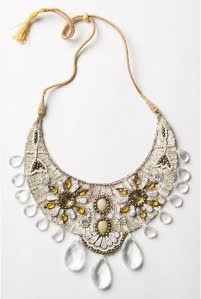 Have you seen the bib necklaces this year? I picked this photo up from the internet somewhere or other, but it is just on e example. Seems pretty easy to make - I may give it a try. Stay tuned for posting about the past two weekend's sewing. Varying results! New plus size dress on Burda Style. Click on the title to go to the link. Its $4 to download. It looks promising. I especially like the mandarin collar. And the color of course. The technical drawing is below. It looks promising, but I have a lot on my plate right now. Had a semi-disappointing sewing time since Friday. Will photo and share tomorrow. I got this great gadget last week and I love it. It holds your bobbins in a tower configuration. Before, I kept them in a little lucite box that often flipped or got knocked around. With the bobbins in this thing, if you knock it down they don't go flying all over! It is easy to slip them in and out. You can easily see the color of your thread. And it is really easy to organize - I have empty bobbins in the dark green section on the bottom, and bobbins with thread on the yellow sections. I might have to get another to keep the Singer bobbins in for my embroidery machine. I got mine from Keepsake Quilting (click on link above), but it is designed by Nancy's Notions. I give it a big thumbs up!